Easton Leisure Centre, Monday 6:30pm. David Lloyd Club, Westbury Tuesday 6:30pm. Horfield Leisure Centre Saturday 8.05am and 9:00am. 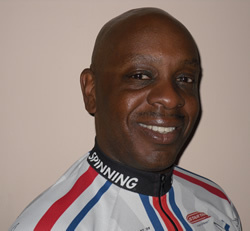 Les is also Team Presenter and Support crew member with the UK and Ireland Spinning Team, working alongside the Master Spinning Instructors. You can ride with Les at the weekend Fitness Fiesta at Brean Sands, near Weston super Mare in November. Follow the link for a weekend of fun filled, action packed rides: www.fitnessfiesta.com.